Just like vitamins and minerals, foods also contain certain chemical molecules that can interact with the various cells in our body and even permeate the brain. Housed in the brain are specialized cells called neurons, which send and receive signals that work to control our movements and emotions. Given that these cells encompass our main control center, it’s not surprising then that they must be tightly regulated in order to maintain proper body function. How is this level of regulation achieved? Neurons receive signals from naturally occurring molecules called neurotransmitters, which are able to activate the brain cell like flipping on a switch. 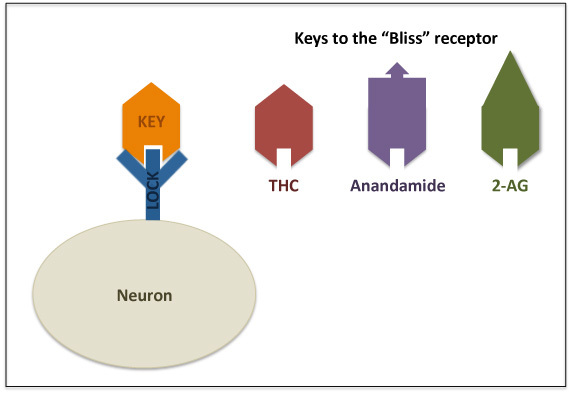 Similar to a lock and key system (refer to the figure below), each neurotransmitter (key) has a specific structure, which can then bind and “unlock” certain receptors (lock) that are found on the neuron’s surface. In this way, neurons are only turned ON after a certain neurotransmitter binds to it’s receptor. In order to turn the neuron OFF, additional enzymes found in the body promote the removal (via degradation/breakdown) of the neurotransmitter molecule. Neurons are regulated by their receptors (lock) binding to neurotransmitter molecules (keys) in the brain. In some cases, multiple keys with similar structures can activate the same lock. After we know how a certain receptor looks, synthetic drugs can be designed to fit and activate these same neurons. For example, the opiate receptor binds a group of naturally occurring molecules called the enkephalins. The drug morphine shares a similar structure with this family of molecules and therefore, can also key into this receptor. Importantly, the structure of morphine is highly stable (more resistant to breakdown in the body) and therefore, results in a stronger activation of the opiate receptor and a more intense response. So, what does this have to do with chocolate chip cookies? Remarkably, several years ago scientists found that chocolate contains anandamide, a naturally occurring molecule that activates the cannabinoid (THC) or “Bliss” receptor. Even better, chocolate was also shown to contain 2 additional molecules that closely resemble anandamide’s structure and were found to prevent the breakdown of anandamide, resulting in a more stable interaction between lock and key. The scientists went on to speculate that one potential reason why we enjoy chocolate so much is because it can mimic a sort of euphoric “high”, albeit to a much lesser extent than that achieved with THC. In conclusion, I want to emphasize that my post today does not intend to suggest that chocolate chip cookies should be placed on the gateway drug list. However, I am simply offering some of the interesting science which may help to explain why we open a bag of cookies after a bad day and why we continue to reach for the plate in the hopes of re-creating that first, blissful bite. 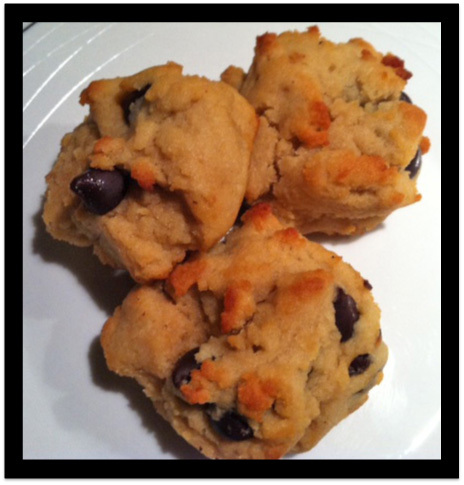 This recipe was modified from Elana’s Pantry, the original recipe can be found here. I found that her recipe yields a crispier cookie, whereas this recipe created a softer, fluffier cookie. Since preferred cookie texture is completely determined by the individual (I was a Chip’s Ahoy Soft Batch kind of kid), I suggest you try both to compare. 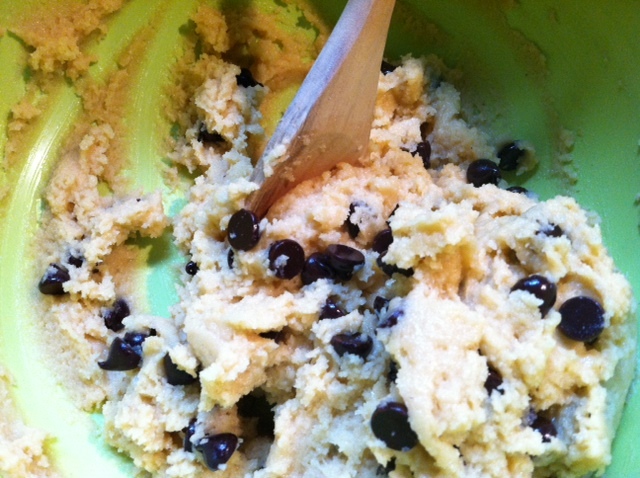 Importantly, both batches were gobbled up in a day…see, no one can resist a chocolate chip cookie. 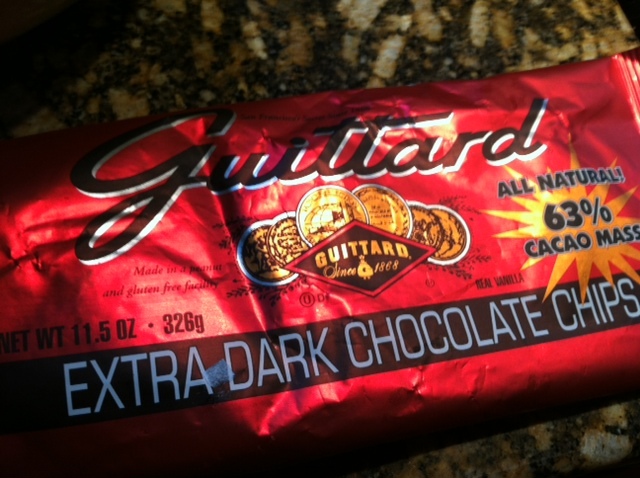 I found this brand at our local Whole Food’s and they are literally the best chocolate chips I’ve ever tasted. Remember, the darker the chocolate, the higher the cocoa content. Brain cannabinoids in chocolate. E. di Tomaso, M. Beltramo, D. Piomelli, Nature, 382, 677-8 (1996). Previous Post Best paleo breakfast sandwich ever? I’m going to bring some home with me.